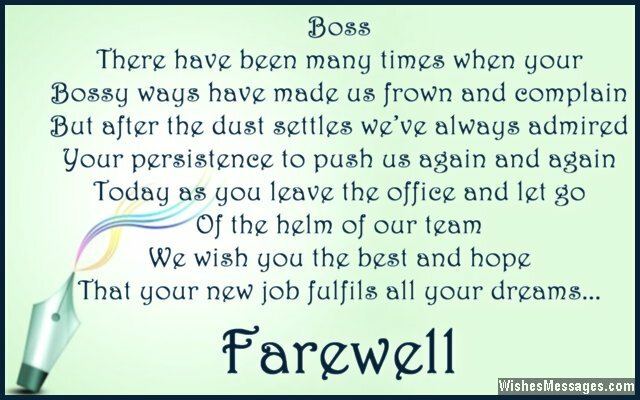 Farewell Messages for Boss: It is always nice to see an annoying boss resign or retire. 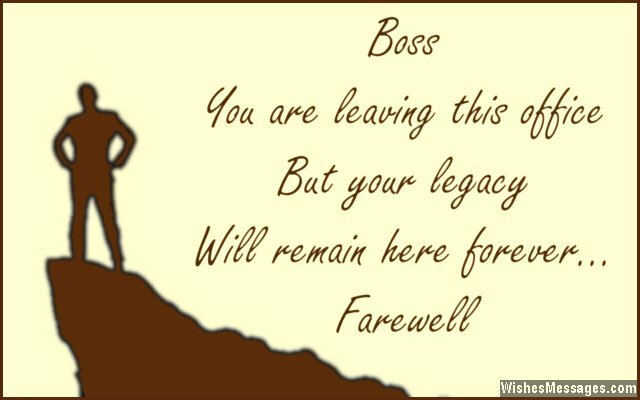 But if an admirable and respectable boss is leaving the company – write sweet notes on a farewell card to say goodbye. Apart from the greeting card, take ideas from this post to think of inspirational, motivational and funny quotes you can include in your farewell speech for your boss. Be creative and put in some effort to make your wishes stand out from the rest of your colleagues. Even though he or she is no longer your boss, the bridges you build today may be the ones that catapult your career higher tomorrow. 1) Boss… there have been many times when your bossy ways have made us frown and complain. But after the dust settles we’ve always admired your persistence to push us again and again. Today as you leave the office and let go of the helm of our team, we wish you the best and hope that your new job fulfils all your dreams. 2) You have always been… more of a friend, less of a colleague, more of a leader, less of a boss. Farewell. 3) On one hand I feel happy that I no longer have to listen to your angry rants, but on the other the thought of having a new boss makes me wet my pants. Farewell. 4) Other bosses give orders, you gave us direction. Other bosses give targets, you gave us a vision. Other bosses lead by authority, you have always led us by respect. Farewell to a boss, like no other. 5) Your farewell marks the end of the glory days that our team has seen. Because you are the best boss there could ever have been. Goodbye. 6) The biggest laurels on the mantelpiece of your life will be the respect, love and affection of all your colleagues. Farewell. 7) Success and failure are a part and parcel of everyday work life’s highs and lows. But the memories of working with an inspirational boss like you will never go. Farewell. 8) Farewell to a boss who used his authority to catapult us towards success, not subdue us under hierarchy. 9) This company has been my pottery wheel, you have been the potter and I have been a pot in the making. Farewell, to the boss who has shaped my career. 10) While we bid farewell to you, we feel pity for your new colleagues today. They have no idea the kind of wrath they have got coming their way. Goodbye boss. 11) As you move outside the cold walls of the office, we can’t wait to begin a warm friendship on the outside. Farewell. 12) Now that you have stepped down as Captain of the ship, who will sail us through choppy waters? Farewell, boss. 13) Your arrival in the office was as our Boss, but your departure from the office will be as a Friend. Farewell, mate. 14) Most bosses teach their subordinates how to be more efficient at work. You taught us what was more important – how to be happier at work. Farewell. 15) I have learnt the principles of business not from a book but from an encyclopedia that walks and talks – my boss, who I hate to see leaving. Farewell. 16) Dear boss… you are leaving this office, but your legacy will remain here forever. Farewell. 17) Your reign as the boss may have come to an end, but it marks the ending us being colleagues and the beginning of us being just friends. Farewell. 18) Company procedures taught us how to make good decisions by following operational manuals. You taught us how to how to make good decisions by following our hearts. Farewell to a true leader. 19) Dear boss… your cabin is not the only place which will be empty when you leave. Our hearts will be empty too. Goodbye. 20) A great teacher is not necessarily a great mentor. A great mentor is not necessarily a great leader. A great leader is not necessarily a great teacher. But you have been a great teacher, mentor, leader and boss – all rolled into one. Farewell. 21) It doesn’t matter whether or not I get the opportunity to work with luminaries like Steve Jobs or Jack Welch because I have already worked with a luminary like you. Farewell. 22) Maybe one day our professional paths will cross each other once again and I will be able to repay the debt of guidance and mentorship to you. I can’t thank you enough for everything, farewell. 23) We wish you good luck as you set out to pursue a new role in a new company. We hope that there is nothing but success and promotions in your career’s destiny. Farewell. 24) As a boss, you have always seen us through tough times at work. But now that we are just friends and no longer colleagues, I hope I can reciprocate the favor someday by helping you see through tough times in life. Farewell. 25) Ordinary employees like me become extraordinary when they are trained by awesome bosses like you. Farewell to my favorite boss. 26) Farewell, to the boss who showed us that secret to success lies in simple things like hard work and perseverance. 27) You may have been my boss for just a few years, but your inspirational and motivational words of advice will push me to do my best for the rest of my life. Farewell. 28) All these years you were my boss first, friend second. Now that you have resigned, I look forward to being just your friend. Farewell. 29) You may have left for greener pastures but in doing so, you have made us go blue. Goodbye boss, we will miss you. 30) There are two types of bosses – one, whose departure makes employees happy and the second, whose resignation makes employees sad. You are definitely the second time and we are all going to miss you real bad. Farewell. 31) Your towering presence was always inspiring, your reassuring words were stress busting and your constant support was highly motivating. Farewell to a boss, who we will be dearly missing. 32) Dear boss… in your new job, as you come across more annoying employees than us – you will realize how dealing with us has never been a fuss. Farewell dear boss. 33) I cannot measure your contribution in my life by counting the promotions and perks. The value you have added to my career with your inspirational guidance is actually priceless. Farewell boss. 34) Brainstorming sessions will stop being fun without the person who has been the brains behind the company’s every move. Farewell. 35) We all wish your resignation gets rejected and your dog eats up your new appointment letter. Farewell to a boss who we don’t want to let go. 36) I wish my employment contract had a clause which bounded my job with yours so I could follow you wherever you go. Goodbye. 37) We may get new leadership, but that doesn’t mean we will get a leader who inspires us like you did. Farewell, we will miss you. 38) This department may achieve great success and accomplish new feats in the future. But because of your absence, we won’t cherish it as much as we have been doing until now. Farewell, boss. 39) I never knew, that it would be so difficult to say goodbye to my boss – until I had a boss like you. Farewell. 40) Today officially marks the end of the time when you can shout and scream at us at the pretext of being our boss. Farewell.